Owned by PT. ASM, Dolphin Fast Ferry is a brand new aluminium passenger ferry that was recently launched in May 2018 with cheap fares. The main routes served by Dolphin ferry are between Batam in Indonesia and Johor Bahru in Malaysia. This border crossing by sea operated by Dolphin Fast Ferry will improve transportation transfers for tourists who wish to travel between the two destinations. 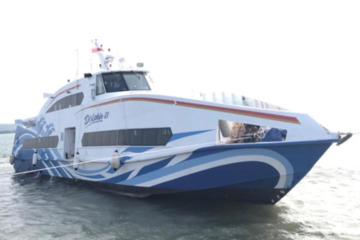 Although there is only a limited number of ferries currently in service, there will be a total of 10 ferry units expected to serve Batam – Johor Bahru route and vice versa soon. Batam to Johor Bahru is a popular route for ferries as it facilitates travellers’ convenience with its strategic locations at Indonesia’s Batam Center and Johor Bahru’s Puteri Harbour. Dolphin Fast Ferry aims to provide travellers with comfortable ferry rides and affordable ticket prices available now on Easybook. Serving as a new ferry operator, Dolphin Fast Ferry is designed with the standard 148 seats and 20 VIP seats. The ferry offers basic facilities of air-conditioning, cushioned seats and TV to allow passengers to have a smooth sailing journey. There are tray tables attached to the seats to let passengers have their meals with ease. Passengers can be rest assured about their safety with CCTV installed in the Dolphin Fast Ferries. Travellers from Johor Bharu can get on the free shuttle services available at Larkin Sentral Bus Terminal to get to Puteri Harbour to board the next Dolphin Fast Ferry. Dolphin Fast Ferry only serves the route between Batam Center and Puteri Harbour, Johor Bahru. Grab the cheap ferry tickets provided by Dolphin Fast Ferry through Easybook today by following a few simple steps.